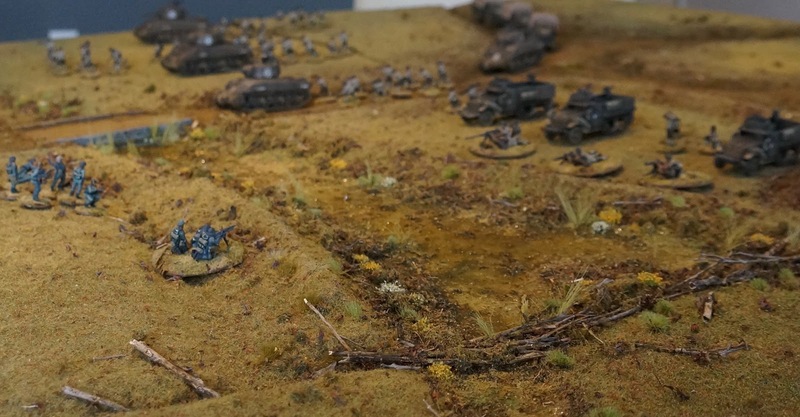 Normally wargaming terrain does not match the basing of the miniatures used on the tabletop. My latest push has been to make all of the the models, terrain, and even the table itself, match in every way possible. 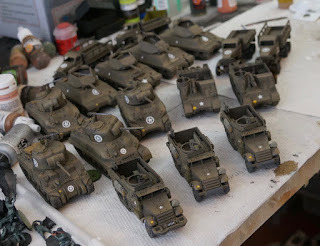 This means using the same dirt tones from the roads on the vehicles, and having the same basing applied to the miniatures. Above, you can see the result. 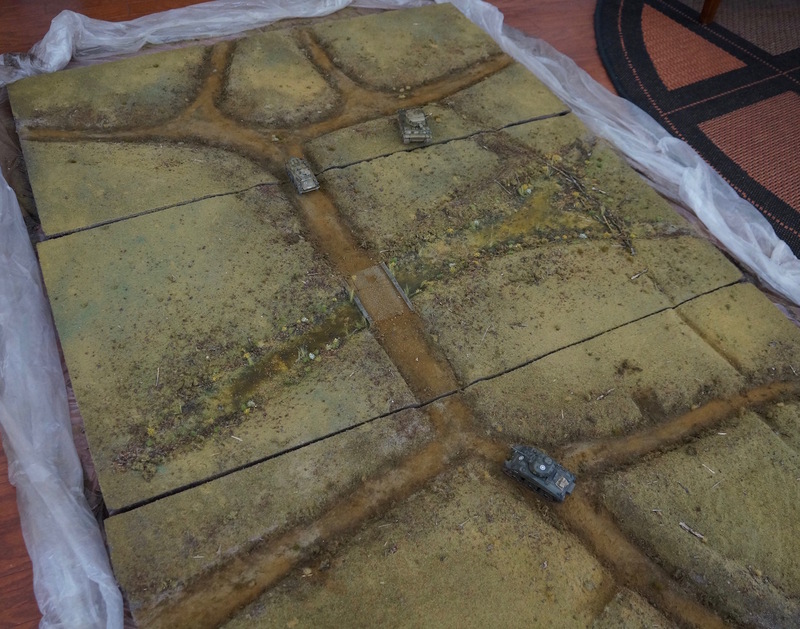 Now these photos do not show the rest of the terrain features that will go on the board, such as a norman church, small house, bocage, and telegraph poles, but it does show how well the bases match the table. One of the interesting side effects of making everything match, is that despite the low-ish painting quality of the infantry, they look really good on the table. I really like how the bases are minimized from view. If I hadn't started going to historic miniatures gaming conventions I would not have even attempted such a think. Maybe I need to make building a table part of every army building process. 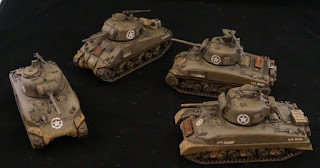 The American forces are almost complete! At this point, we can almost play the Bolt Action scenario I've been working on. I'm pretty sure the allies players are going to enjoy this kind of fire power, especially because full tank platoons are included. 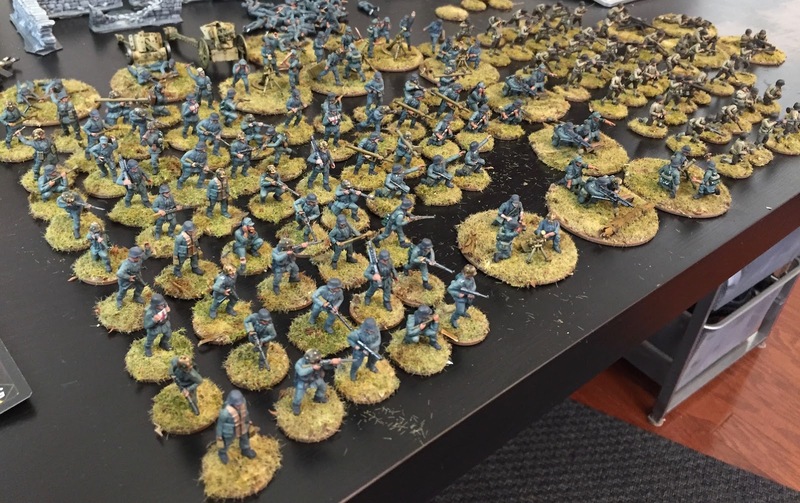 I have some final work to do on the trucks, and have to paint another 50 riflemen, but overall, I am really really happy with the progress I've made. 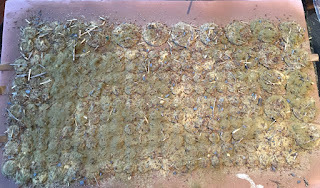 The mud is a mixture of weathering powder and plaster, slathered on. 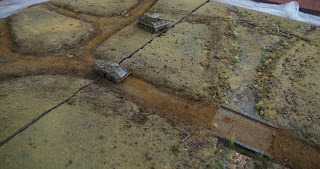 I then used a flicking brush motion to add light and dark oils over the top of the mud patches. 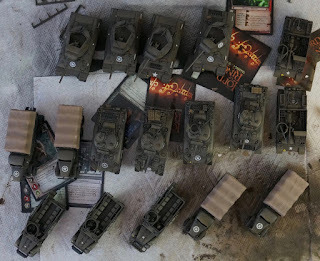 At first I thought I may have gone overboard, but when the force is viewed together it looks really good on the table. 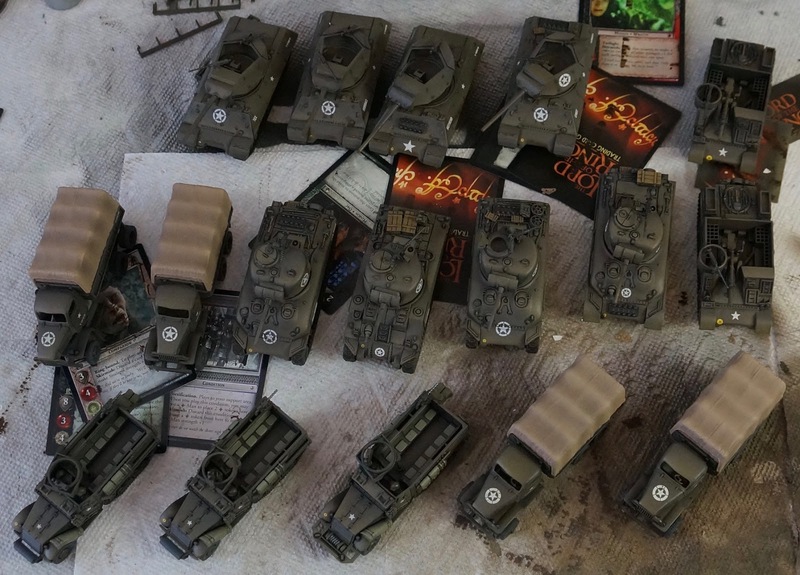 One oddity of batch painting like this, is that my infantry are a much lessor quality than the vehicles. I may go back and rectify that at some point, but I suspect this will be the standard for a while. 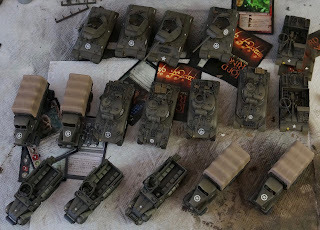 Conventions and club games are rough on miniatures, so it makes sense to stick with more durable paint jobs. 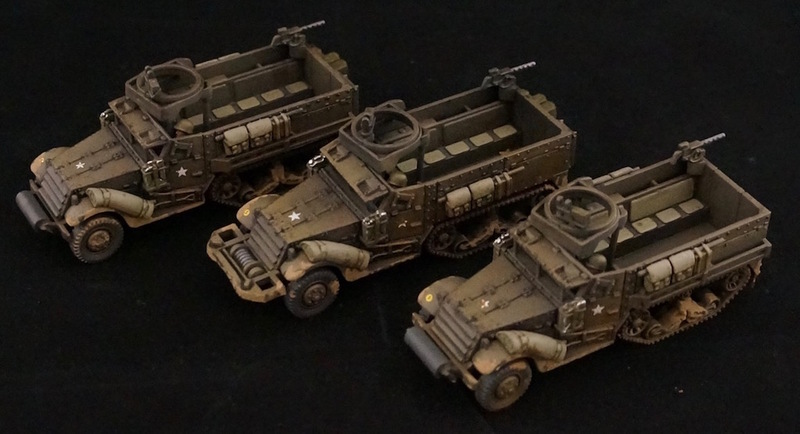 With pin washes in place, the vehicles are really starting to look the part. This is the point that many people stop. For me, this is finally the step where I can start weathering the vehicles. 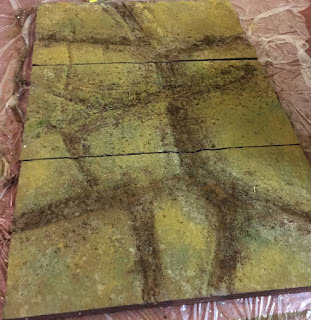 This means painting on chips, adding streaking grime, adding watermarks, adding dust, and adding mud. Once all of those things are in place, these will look less like toys and more like scale models. On the other hand, they are far enough along now to be used in some preliminary games. That is a pretty big step forward in our 1/72 scale model inventory. 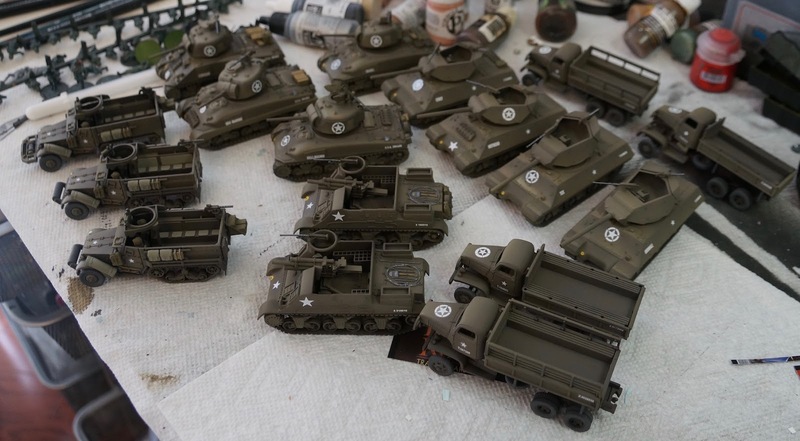 With my 1/72 scale terrain ready to play on, and my german forces ready for battle, I decided to use the winter storm we've been having here on the east coast to batch paint up some vehicles for my American forces. Pictured here are 3 M3 half tracks, 4 Sherman tanks, 4 M10 Wolverine tank hunters, four trucks, and two M7 priests. The kits vary from quite nice plastic model kits, to very lackluster armourfast fast build kits. Despite the wide range in detail, I think these will look great on the tabletop once they have had pin washes, chipping, streaks, and weathering powders applied. 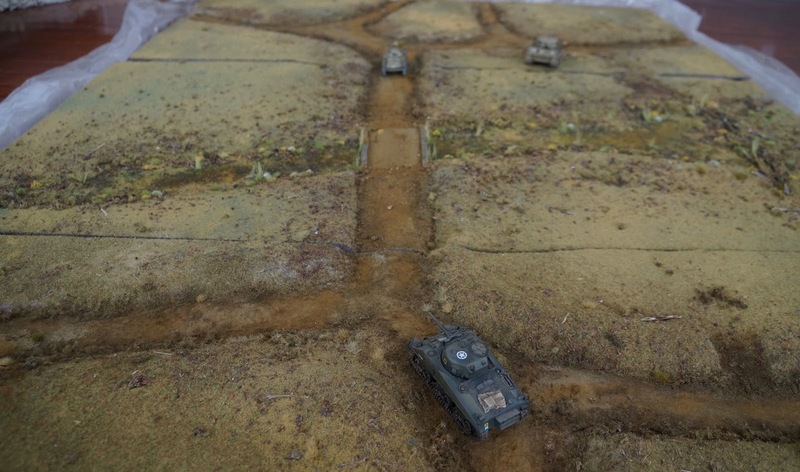 The German forces already have 5 stugs at their disposal, along with a howitzer, and an anti-tank gun. 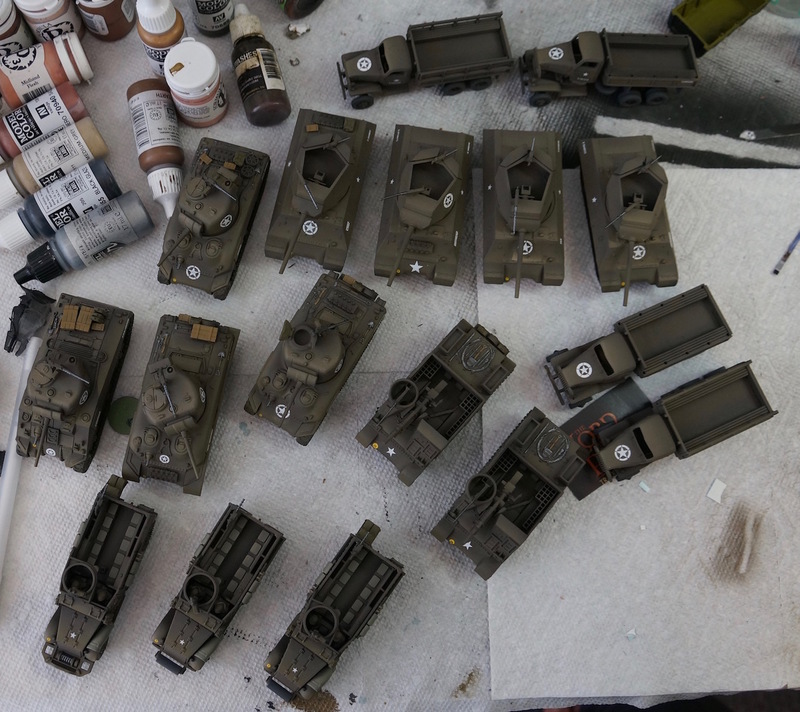 I may paint up a few panthers and a tiger to fill out their list, but once these Americans are finished we'll be ready to play. I've been kicking around how I'd like the first game to go, and I think it will begin with first contact, followed by waves of reinforcements. That will probably play much better than just giving the players all of the toys at once. The American forces will have a platoon of Shermans and a platoon of infantry to advance through the crossroads. 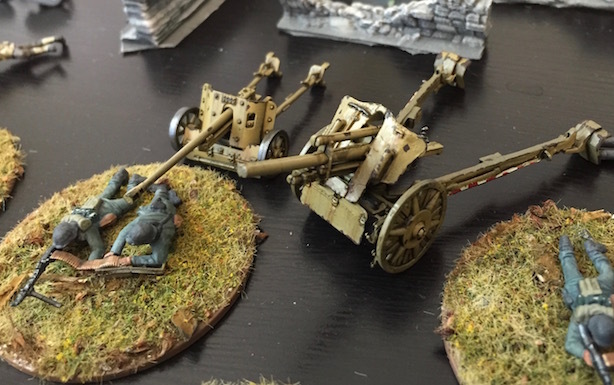 Germans will have a prepositioned anti-tank gun and a full platoon of veteran Heer infantry. 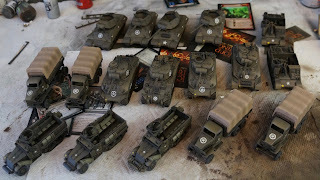 They'll be packing a lot of panzerfausts and panzershreks in addition to ranged in mortar shots. 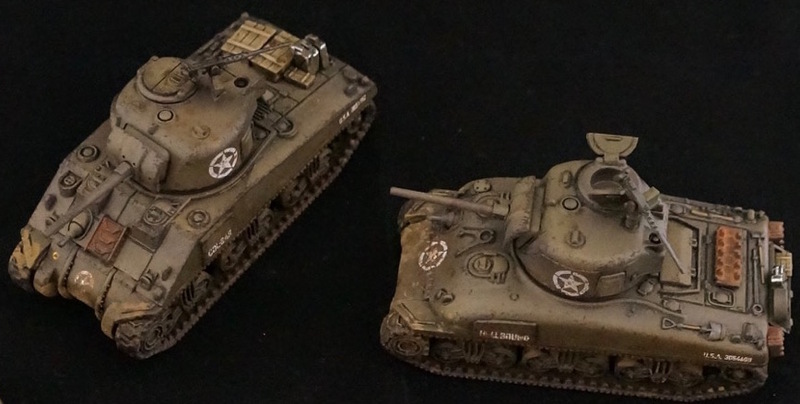 Germans will eventually get a stug zug or tiger as reinforcement, while the American forces will be able to call on an armored infantry platoon and an M10 wolverine platoon depending on the shape of the battle. I think it is important to have a bunch of potential reinforcements, and then let timing and disposition of them depend on the situation on the ground. 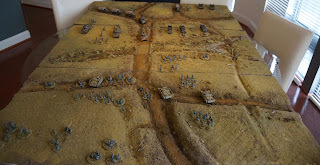 A key to this will be the German team deciding to lure the first platoon into a trap. But you never know how players will decide to act in a GM'd game. That is probably the best part of running one of these. We are having a fun snow weekend here in DC, and I had the chance to work on the table this morning. The river went in after a slew of water issues, and then plants were added all around the water areas. I came up with what I though was a great idea to cast up a bridge, and managed to get it done and placed just before leaning on it. The cracks will need to be covered over with debris. The tanks on the table are for 28mm Bolt Action. 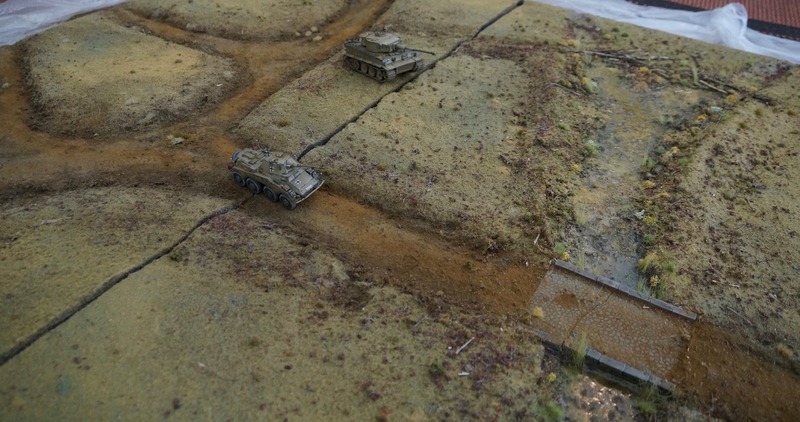 The table was built for 1/72 gaming, which will make the fields feel more like fields. They look a bit rough at the moment, but once the gallon of glue dries I'll be able to move onto the next step, which is smoothing out the roads and making them more of a tan color. These work as muddy roads, but I'd like the center of the road to be dry. 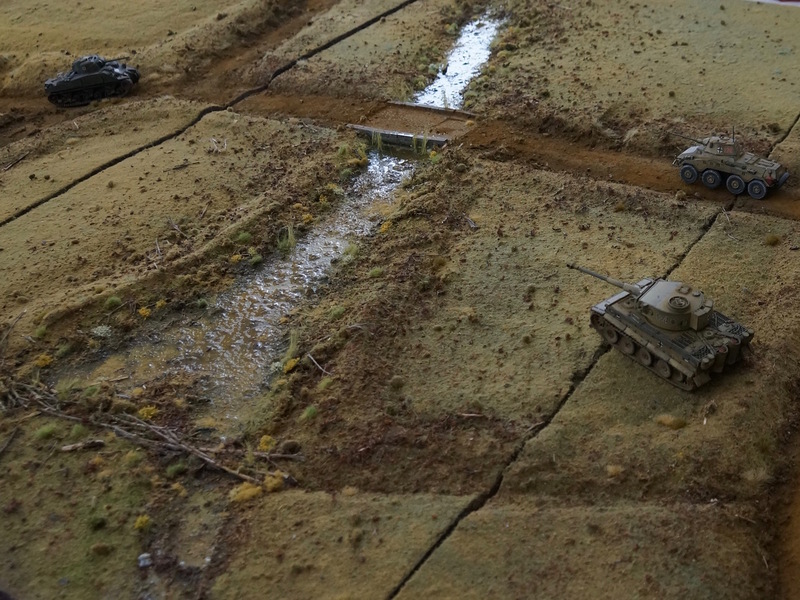 The river section will get some work tomorrow as well, gaining rocks and foliage. The bridge i ordered will not arrive until next week, so the water effects won't be able to go in for quite a while. So, with that laundry list of things to do, I am pretty pleased that this only took half a day to get to this point. I think once all of the details are added it will start looking more the part. I am hoping that the board is spongy enough to allow me to use pins to stick in trees and telephone poles. That is the main purpose of the test. One of the down sides of the board so far, is that even in this wet state, the models are hard to see. Their bases match the boards well enough that visually the troops kind of hide on the table. I've been doing a lot of gaming with our gaming club, and one thing that has stood out (besides the beautiful tables), has been how large we have had to make the playing space for a good participation 28mm Bolt Action game. 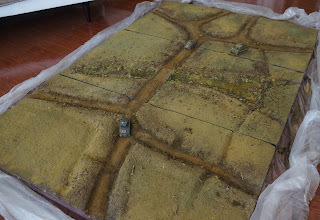 Rather than keep making the tables larger, I decided to play around with scale and drop down to 1/72 scale. I also decided to try and paint the full armies(220+ miniatures) win under a week. The miniatures I picked to experiment with are not the best sculpts, but they were inexpensive, and should hold up to convention games in addition to our club use. 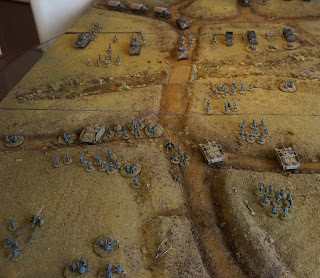 My hope is that this scale change makes it possible to run a couple of infantry platoons, tank platoons, and forward HQ units in the same footprint our 28mm models were using. Did I finish painting them all. No. 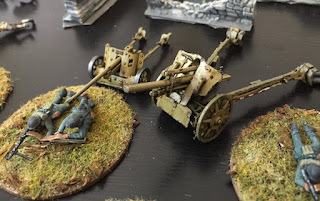 But I think I made enough of a start that these can be used in a normal game of Bolt Action. 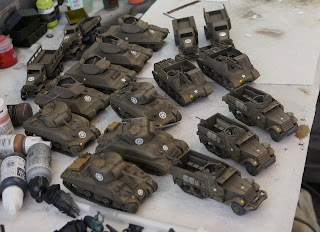 For the full Normandy game, I'll have to churn through more than 50 additional models. At least all of the bases were done ahead of time! While I haven't been posting, I have been painting. I have painted quite a lot. 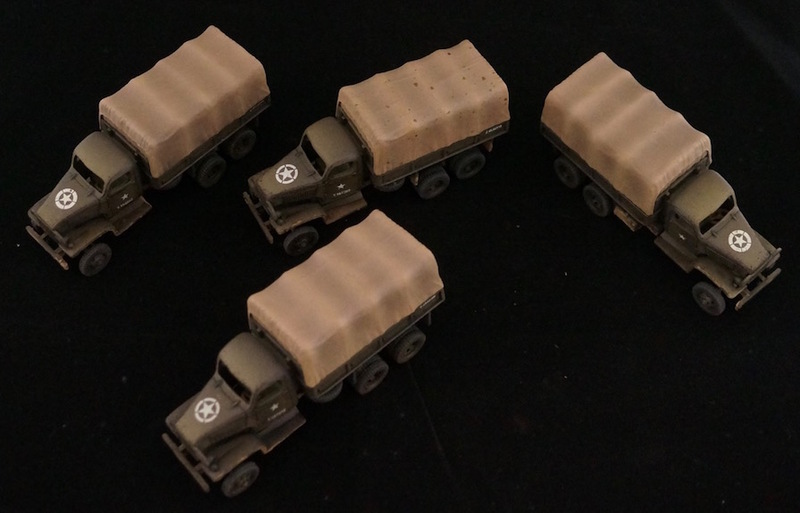 So much in fact, that I needed 220 bases for my 1/72 scale miniatures. Given that I needed so many, I decided to come up with a process that focused less on painting and more on layering. Starting with a brown army painter base coat, I mixed sand, slate, ground up dried bushes (the stuff that woodland scenics uses for trees), green static grass, dried static grass, gw basing material, and a brown colored ballast. I piled the glue on high and dumped the mixture on. 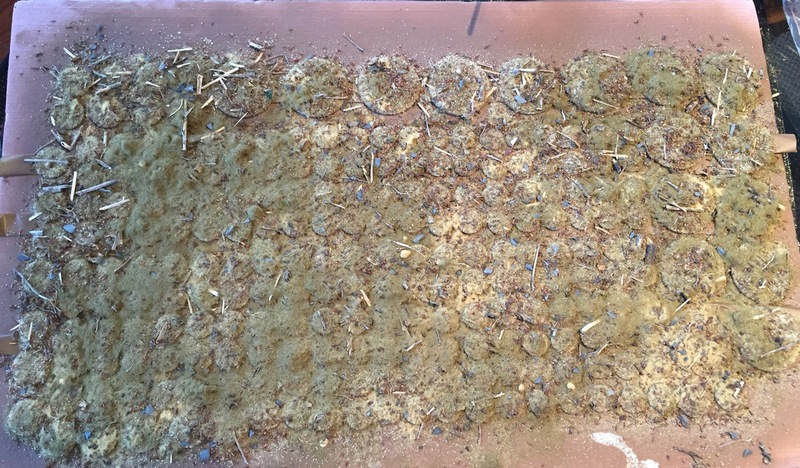 Once the glue started seeping through the mixture, I dumped a load of static grass over the top with the hopes that it would sink into the interstitial places between the rocks and wood bits. 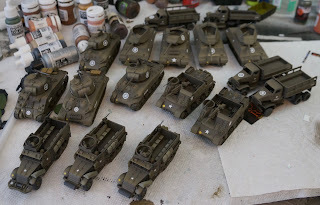 The final step before adding bushes and detail, will be another diluted layer of scenic cement to lock in the details. Then comes weathering power mixed with alcohol. Will this work? Do you think the bases will come out looking ok? What steps would you take? Would you add some bright green plant life and grass over this dead and dying mix? At some point, I'll point shots of the two armies facing off. I've been thinking about scales, and not just because of the New Year! 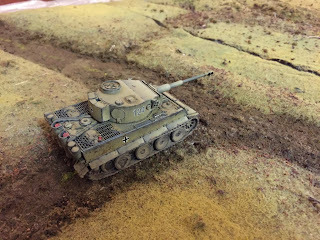 I've been painting 1/72 scale miniatures. Crazy right? This feels like something the old timers did way back when. I just couldn't resist the idea of playing Bolt Action/Battlgroup Overlord at this scale. I think most of our terrain will port over just fine. The real benefit is going to be having additional vehicles on the table and having it look uncluttered. 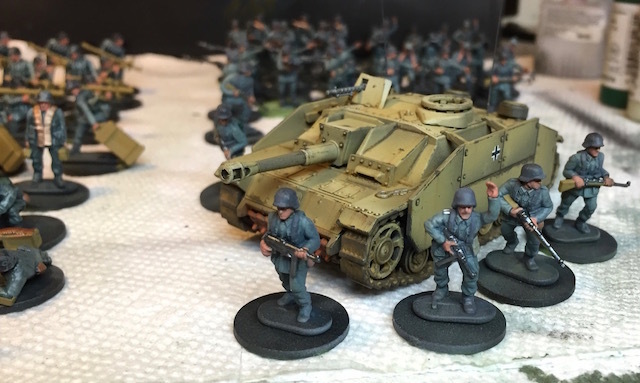 I love the idea of having a group of 5 Stugs supporting a maxed out platoon. With these little guys I think it will work on our normal tables.